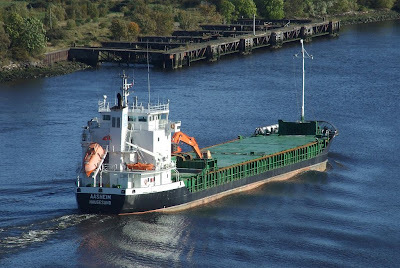 Having left the Clyde late on Monday evening, the hard-working little bulker AASHEIM headed for the massive quarry at Glensanda in Morvern, where she picked up another cargo of aggregates. She arrived back at the Tail o' the Bank this morning, anchoring there until the early afternoon when she headed upriver. Seen from the Erskine Bridge, she is passing the former Admiralty oil jetties at Old Kilpatrick, which closed over twenty five years ago. This time the destination was Rothesay Dock, where AASHEIM is seen having turned in the basin and is in the process of berthing alongside the west wall. She will, as usual, use her own machinery to discharge. In the background are the storage tanks of the Kaneb oil terminal, which receives the fuel delivered to this dock by many of the tankers which have been illustrated before on ClydeSights.